Solyndra has a building, solar panels and machines to sell. How much it can get for them is an open question. NEW YORK (CNNMoney) -- During the weeks of nasty congressional hearings and even nastier columns in the press since solar panel maker Solyndra declared bankruptcy, it's been widely assumed that the debacle cost the government over half a billion dollars. That huge loss may not come to pass. As the guarantor of the loan the company received to build a state-of-the-art factory in Fremont, Calif., the government is on the hook for the $527 million Solyndra ultimately borrowed. But it's not as though Solyndra is completely worthless. The company has some assets it could sell. It has that state-of-the-art factory, all the equipment inside, and a sizable inventory of solar panels. During bankruptcy hearings earlier this week, Solyndra chief financial officer W.G. Stover said the company had $859 million in assets and $749 million in liabilities at the start of 2011. How much those assets are worth now that the company has folded, and where the federal government stands as creditors line up to get their money back, are questions that will be hashed out in bankruptcy court over the next few weeks or months. But some are optimistic Washington can recoup a big chunk of its cash. "The federal government owns the assets of borrowers that default and can manage or sell them," Mark Muro, policy director at the Brookings Institution's Metropolitan Policy Program, wrote in an article earlier this week. "It's conceivable that taxpayers will not lose any money." The path forward: While many analysts don't paint such a rosy picture, they do seem to think the best outcome for Solyndra and its creditors would be for another company to come in and buy it whole. It's generally thought that Solyndra's bankruptcy was caused by its technologically advanced panels becoming uncompetitive with cheaper traditional solar panels as the price for those traditional panels fell. Yet it's possible another firm could tweak the design, infuse it with cash, and attempt to make a go of it. Solyndra's panels were, as the name implies, a cylindrical design, like a florescent light tube. They were more efficient, as they caught light from not only above, but also reflecting off the roof. But they were also more expensive to produce. "It's one thing to say Solyndra's technology couldn't make it," said Shayle Kann, a solar analyst at GTM Research. "It's another to say there no value in cylindrical panels." It's also possible that another, larger firm could buy Solyndra and make it profitable simply by restructuring it in bankruptcy. Nathaniel Bullard, a solar analyst at Bloomberg New Energy Finance, didn't think the technology could be tweaked, as the machines are all tooled to only make that type of panel. But he did say Solyndra's panels have niche applications. They are lighter in weight than traditional solar panels, and so are better suited for older, less robust roofs. "Coming out for bankruptcy, the cost structure could be different," he said. Both Bullard and Kann said the best contender for this buyout scenario would be a large Asian electronics manufacturer, perhaps one that doesn't already make solar panels. "If it's anyone, it's going to be a large conglomerate that hasn't gotten into solar yet and views this as a cheap way to do it," said Kann. But both analysts said Solyndra is unlikely to fetch anywhere near the $859 million the company was supposedly worth in January. And they both put the scenario of a buyout at no greater than 50%. Split up: The other option is that Solyndra will be split up and sold off in parts. This is bad news for anyone the company owes money to. The firm's most valuable asset, the equipment it uses to make the panels, is custom made and highly specialized. It's not useful for anything else besides making the specific type of panel Solyndra made. The other assets are the panels themselves. 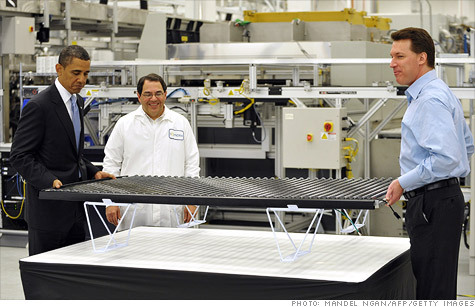 Solyndra has a whole warehouse full of unsold solar panels. Kann noted that they work just fine, and third parties would be able to service them. But finding a buyer for panels that come with no warrantee will be a challenge. Most of the company's buildings were leased, so there's not much property to sell. The new factory Solyndra built with the government's money is 300,000 square feet. Solyndra does own that factory, but it's unclear how much it's worth. Another manufacturing facility the company owned nearby that was almost twice as large sold for $42.5 million late last year, according to The Register, a San Francisco area real estate journal. In the end, it seems like the government will get some of its money back, but it may not be close to the $527 million.